One of the pioneers of the electric guitar in the early 1940’s, who was proficient in virtually every style under the sun, Bunn made his way to rock ‘n’ roll late in the decade as a member of Edgar Hayes & His Stardusters as well as cutting solo records on the side. Teddy Bunn was born in 1909 and was a professional musician since the late 1920’s as a highly acclaimed acoustic guitarist. Briefly appearing with Duke Ellington at the start of his career Bunn drew notice playing with washboard bands, an anachronistic style that was quite popular in the early 1930’s, but it was with the string jazz-band The Spirits Of Rhythm whom he joined in 1933 where he really made his reputation. As most jazz was dominated by brass instruments, and since acoustic guitars had trouble being heard in the arrangements, the string band was one of the few place in which he could stand out and their popularity led to him cutting sessions with a wide array of big names in search of a skilled guitar player to add something different to their sound. In 1940 Bunn made the switch to the electric guitar which Charlie Christian had began to showcase in jazz a few years earlier, but while Bunn’s skills on this instrument were first rate the prevailing mindset of the guitar as being superfluous in many jazz ensembles, save for incidental accompaniment, meant he had little chance to showcase his talents, even when he was playing alongside such luminaries as Lionel Hampton. He made some records on his own in the early 1940’s and continued doing sessions as a sideman when he was enlisted by pianist Edgar Hayes, another jazz act who’d had earlier success only to see opportunities to record dry up, and the group they formed, The Stardusters, worked the California club scene for much of the decade, their sound evolving as the styles around them changed. In 1949 they were finally given a chance to record and set out to make their name not in jazz, or blues, but rock ‘n’ roll and scored out of the gate with their first release and followed it up with another national hit and many regional best sellers, as well as backing other vocalists on the Exclusive label. Meanwhile Bunn was given the opportunity to cut records under his own name for Selective Records, though he took the Stardusters rhythm section with him, augmented by other musicians, and similarly pursued rock styled material which didn’t have the success of his work within Hayes’s group. When Hayes and The Stardusters were inexplicably unable to find a recording contract as the 1950’s dawned in spite of their recent commercial returns they went back to club work and Bunn became something of a musical vagabond, utilizing his skills in jazz, blues and rock for whatever role he was needed, albeit none of them in the spotlight. 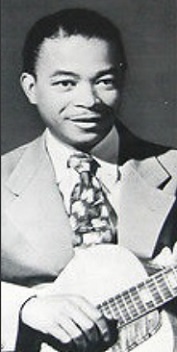 After doing time with Louis Jordan’s group Bunn suffered a series of health problems including a stroke which left him incapacitated and he died in 1978, his contributions to the evolution of the guitar from acoustic to electric and from a little featured part of the ensemble to the leading role in much of music of the latter half of the Twentieth Century having gone mostly unrecognized.